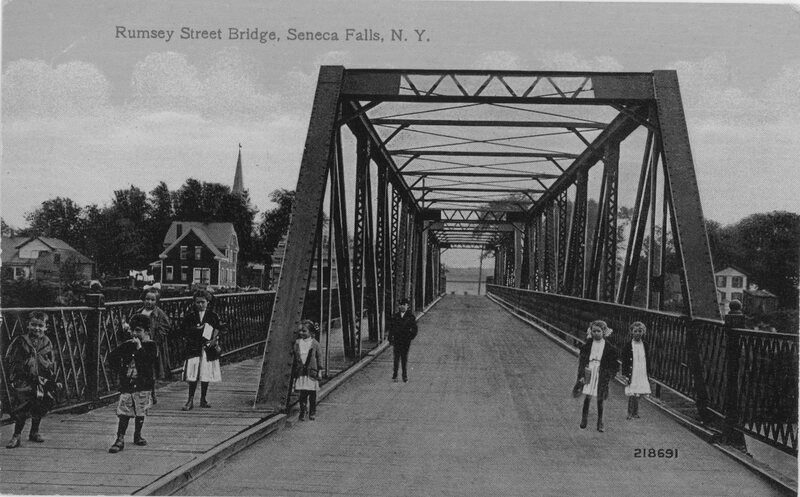 The truss bridge over the canal in Seneca Falls is the spitting image of the bridge at which George Bailey contemplates suicide in the film. Courtesy of the Seneca Falls Historical Society. 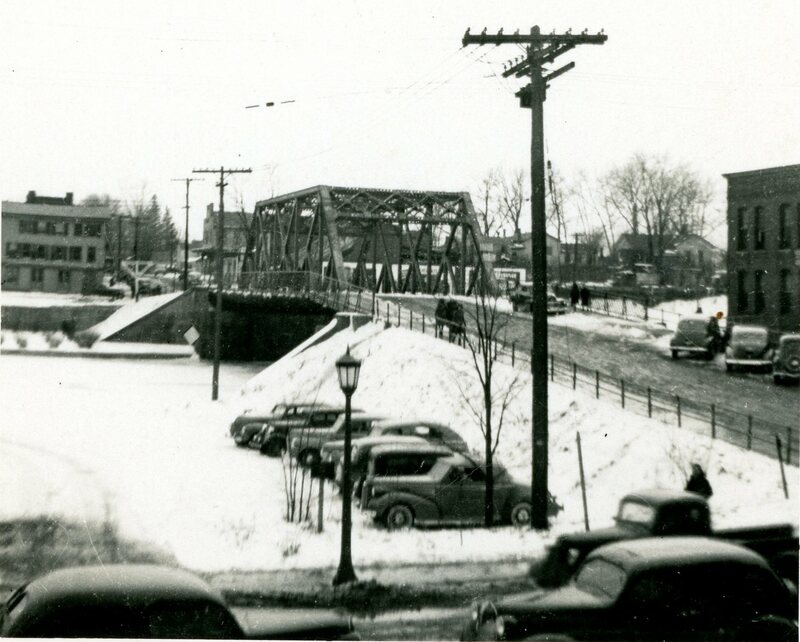 An older shot of the Bridge Street bridge in Seneca Falls. Courtesy of the Seneca Falls Historical Society. The Avery Partridge House, at 54 Cayuga Street in Seneca Falls, resembles the old “Granville house” where George and Mary Bailey live in the film. Courtesy of the Seneca Falls Historical Society. Seneca Falls and Bedford Falls are both similarly situated in upstate New York along canals. Courtesy of the Seneca Falls Historical Society. 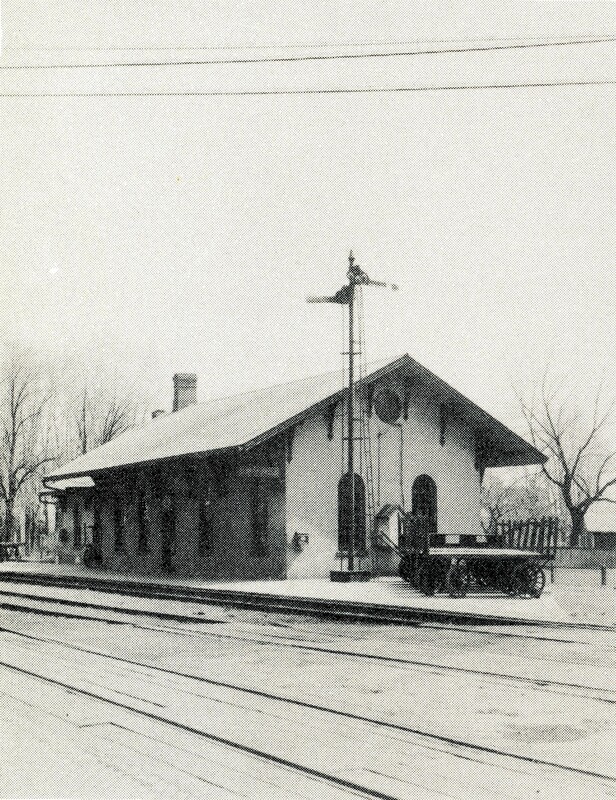 The Seneca Falls train station, pictured here in 1940, closely resembles the film version. The building is now the town hall. Courtesy of the Seneca Falls Historical Society. Is it Bedford Falls or Seneca Falls? The main streets of both towns bear an uncanny resemblance. Courtesy of the Seneca Falls Historical Society. Both Bedford Falls and Seneca Falls are in the same place—in upstate New York, and near Rochester and Elmira, both of which are referenced in the movie. There are other geographic clues. At the time the film was made, Seneca Falls had a train going to Buffalo, just like the film town. Bedford Falls also had Genesee Street as one of its main streets. Seneca Falls’ main street, called Fall Street, is part of the old Genesee Turnpike that once ran across New York State. History also binds the two places, real and fictional. Both were mill towns with a canal. 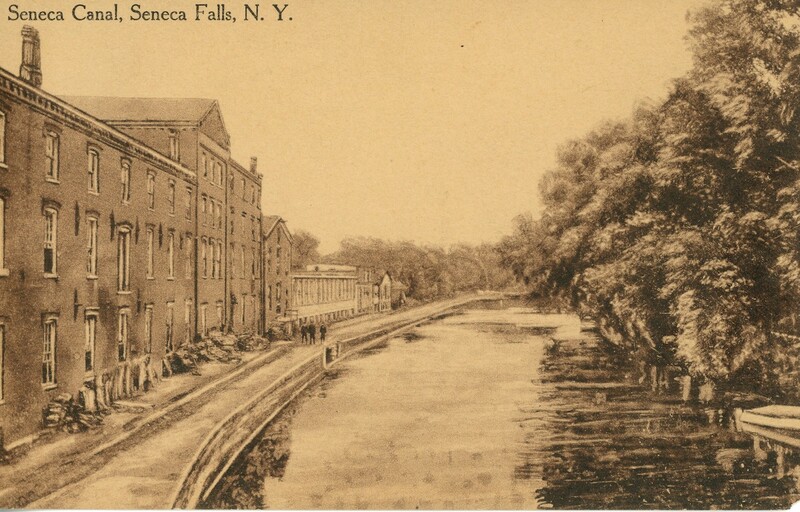 Prior to the Second World War, Seneca Falls was a town of factories with many employment opportunities which drew Italian immigrants, including my own grandparents, here. New housing developments had to be constructed for these new arrivals. In the movie, Bedford Falls seems to share a very similar story. But it is in the appearances of the two town’s buildings where the similarities seem positively eerie. 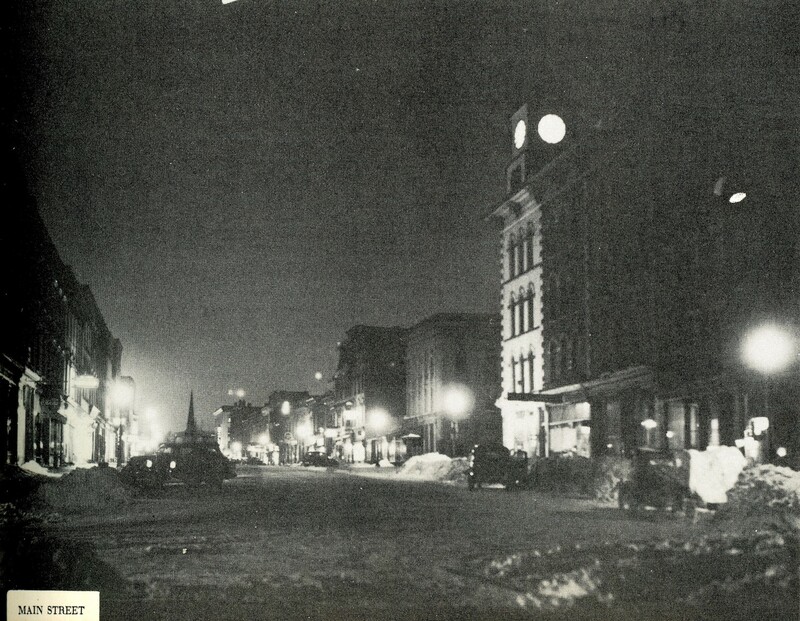 Photos of the Seneca Falls main street from 1940 might have been taken from the film itself, even though the scenes in “Bedford Falls” were actually shot at the RKO Ranch in Encino, California. At the time of the movie’s filming, Seneca Falls’ downtown had a building and loan company, and a department store, as well as globe street lamps and a median running down a portion of the main street. And the old New York Central Railroad Passenger—recently converted into the town hall—is the spitting image of the small station where so much drama takes place in the film. 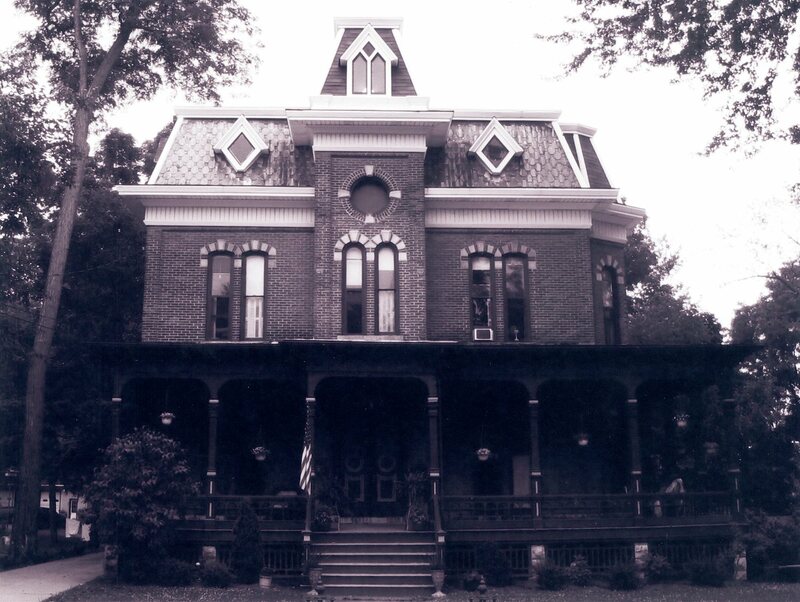 The old Victorian mansions on the residential streets of Seneca Falls resemble those of Bedford Falls. Some here say the Partridge house at 54 Cayuga Street is a dead-ringer for the old Granville House where George and Mary Bailey settled, and where the movie’s famous climactic scene takes place. The bridge may be the most obvious connection. As in the movie, we have a steel truss bridge over our canal; the two might be hard to tell apart in pictures. And our bridge even has its own angel, a human nod to the “Clarence” angel who intervenes as George Bailey contemplates suicide. Today, a plaque honors the memory of Antonio Varacalli, who died in 1917 when he jumped from the bridge to save a suicidal woman. Other important residents from Seneca Falls history have their cinematic equivalents. Norman J. Gould, the owner of Goulds Pumps, the largest pump manufacturer in the world at one time, resided in Seneca Falls. He bears a striking resemblance to Mr. Potter, the main antagonist of It’s a Wonderful Life, who was also a wealthy business owner in his community. Just as Mr. Potter had his initials on his carriage, Norman Gould drove around with the license plate NJG1. We also had a George Bailey in John Rumsey, a local manufacturer who loaned his employees money to build homes—a section of Seneca Falls they called Rumseyville. Perhaps such people are small-town archetypes, but another human binds Bedford Falls and Seneca Falls: Frank Capra himself. The film director visited Seneca Falls in 1945, as he had family in Auburn, New York. A local barber, Tom Bellissima, recalled cutting his hair and joking about their names (Capra in Italian means goat and Bellissima means pretty one). Tom had just immigrated to America, so he was not familiar with American cinema and didn’t know who Frank Capra was. It would be several months later when attending the movies that he saw Capra’s name and remembered the man who had his hair cut in his shop. None of this proves that Bedford Falls is based on Seneca Falls. Capra never mentioned Seneca Falls in his memoir, and Philip Van Doren Stern, author of the short story “The Greatest Gift” that inspired the movie, said he had no specific place in mind. But the link has since been reinforced in the real world, by actual exchanges between the film’s cast and the town’s people. Karolyn Grimes, the actress who played the Baileys’ daughter Zuzu, has been coming to Seneca Falls since 2002 for annual It’s a Wonderful Life celebrations, held the second weekend in December. “Coming to Seneca Falls is like coming home… I think it is the real Bedford Falls,” said Karolyn when she first arrived in 2002. In more recent years, other actors who played children in the movie—Jimmy Hawkins (Tommy Bailey), Carol Coombs Mueller (Janie), and Jeanine Ann Roose (Young Violet)—have started attending the celebration. Why don’t you come to Seneca Falls, walk the streets, examine our architecture and bridge, meet Karolyn Grimes, and attend the “Dance by the Light of the Moon” (a nod to a dance and a song from the film) at our local high school? Then you can decide for yourself whether Seneca Falls is the real Bedford Falls. Frances T. Barbieri is the executive director of the Seneca Falls Historical Society. She is a second-generation Italian American who was born and raised in Seneca Falls.